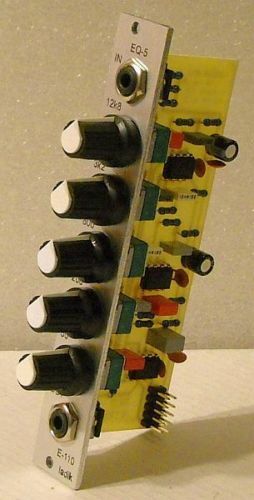 E-110 5-band EQ module for Eurorack / Doepfer A100 system. Control range +-12dB, 50 / 200 / 800 / 3200 / 12800Hz bands. Very small phase shift, low noise design (NE5532 ICs), foil capacitors only in audio path. This is not filter, bands cannot be fully defeated.